when the pace was relaxed and the atmosphere elegant. Maison Perrier today features spacious bedrooms and luxurious bathrooms. Situated in the Uptown/Garden District area of New Orleans, Maison Perrier is a casually elegant reminder of times gone by. 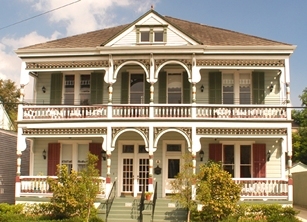 Ornamental woodwork, wonderful antiques, delicate chandeliers, and of course, Southern hospitality welcome you to our exquisite bed and breakfast. Maison Perrier is perfect for weddings, company retreats, family gatherings or quick romantic getaways. Situated in a beautiful, quiet neighborhood with lovely homes on every corner. Only three blocks from the St. Charles Avenue - one of the most beautiful streets in New Orleans with its 100 year-old Oak trees and impressive mansions. The St. Charles Street Car line takes you on a quick ride to the French Quarter. Guests can enjoy free wireless connectivity throughout the inn.